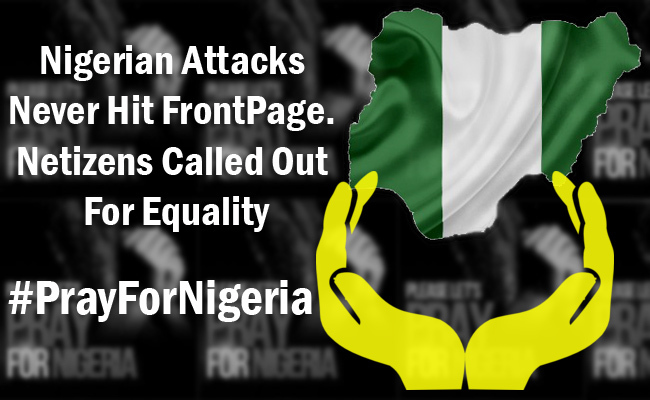 Home Netizens News Nigeria World-News Nigerian Attacks Never Hit FrontPage. Netizens Called Out For Equality. Nigerian Attacks Never Hit FrontPage. Netizens Called Out For Equality. People are still mourning after the tragic bombings in Brussels, Belgium. But on March 24 (Thursday), netizens took on their social media accounts to cry against selective journalism as news about another Islamic extremists group called Boko Haram who burned 86 children in Nigeria surfaced but were not even broadcasted nor covered by the media. Netizens were furious both with the facts that 86 innocent children were burned alive on February 1 this year by the said terrorist group but the media did not even care enough to cover it. The sad part was that it was neither the first nor the last terrorism act of Boko Haram in Nigeria to date and nothing was even released in mainstream media. On 2014, Boko Haram also kidnapped 219 schoolgirls. While the latest suicide bombings happened on March 16, 2016 (Wednesday) that destroyed a mosque in northeastern Nigeria, killing 25 people with atleast 18 people wounded. The suicide bombers were female, a known strategy of how Boko Haram carry out its attacks. The first bombing occurred in the mosque and followed by the second in a building in Ummarari, near at Mundari the capital of Borno. Netizens condemned how selective mainstream media could be and accused them of depriving Nigerians the equal opportunities to be aided like of what Brussels and Paris had. #PrayForNigeria spread like a wildfire on Thursday together with the appeal to the media to include news from third world countries and not just cover those from Europe or the first world's. The same sentiment actually trended first when the Syrian attacks happened but did not earn equal attention and sympathy as compared to the Parisian attacks which only happened a few hours behind.